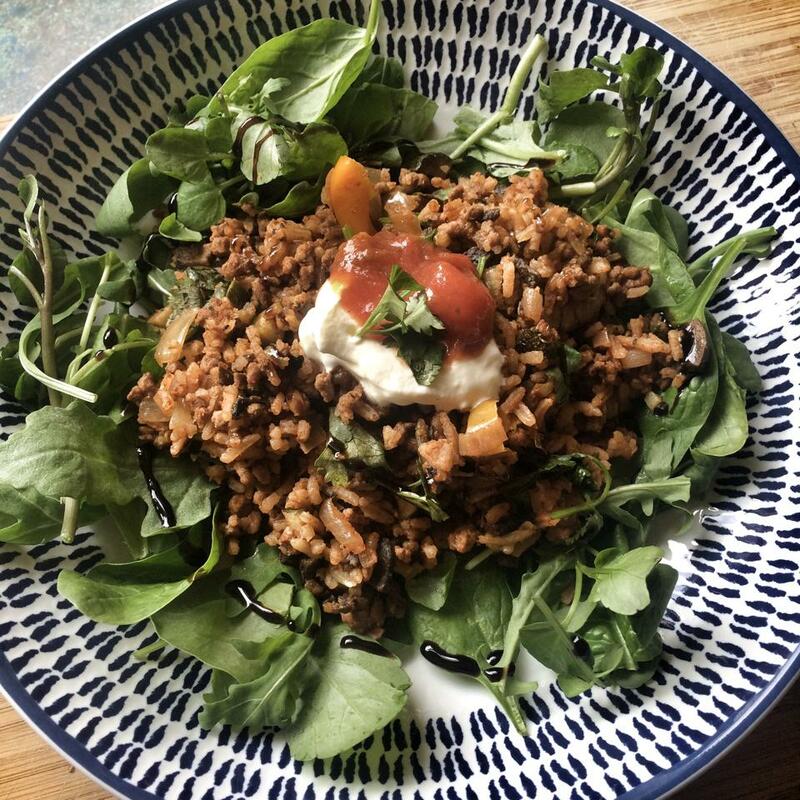 Turkey mince is a great addition to any freezer when you are trying to keep healthy. Not only is it low in fat but it’s also really cheap. The selection of recipes out there which use it however are rather meagre if you don’t fancy going to the effort of making meatballs or burgers. That’s why, this week, I decided to try something a bit different….stuffing it into some peppers! This is a great recipe if you are a bit short on time and even a bit low on points. You get a tasty meal, packed with flavour and lovely and filling. If you don’t have time to stuff the peppers you could just add more pepper to the mince mixture and have yourself a rice bowl. I’ve tried both stuffed into peppers and just in a bowl with some salad. Both are delicious. I served both versions with a big green salad with fresh coriander and a tsp of half fat sour cream, guacamole and spicy salsa. There are loads of cheats to this recipe. You can replace the spices with a fajita packet mix (I like discovery medium). You could also use lean beef mince instead of turkey mince but this would make it 8sp per person. You could even use microwaveable rice to make this even easier! First pop your rice on to cook in a pan of boiling water, throw the stock cube in and stir so it dissolves. While the rice is cooking you can get on with the rest of the dish. Pop your peppers (minus the top or ‘lid’ as my other half likes to call it), in the microwave for 4 minutes to soften. Then, take a large frying, spray with 1kal and fry the onions for around 5 minutes until they start to soften. Then add the mince, fry for another two minutes and then add the spices and sugar and season well with salt and pepper. Fry for another two minutes and then add the courgette, left over diced pepper and mushrooms. Fry for another few minutes until everything has started to soften. Add the chopped tomatoes (or if using tomato puree, make a well in the centre of the pan, add the puree and water, stir and then combine with mince mix). Simmer until the rice is ready. Drain the rice and then add to the mince mixture. Simmer for a minute or two so the rice combines nicely with the mince and sauce. The mince should be evenly distributed throughout the rice and the mixture not too watery. If any excess water, simmer until gone. Stand the peppers upright into a baking dish and scoop the mixture into each until full. Top each pepper with 10g cheese and then pop into the oven for 15 minutes until the peppers are a little charred. Serve with green salad with a sprinkle of fresh coriander. I also served mine with a tsp of half fat sour cream, guacamole and spicy salsa (don’t forget to add the extra points if you have these). These are great, me and my husband both loved them. I couldn’t even finish a portion, which is amazing for 7sp! I couldn’t see sugar on the ingredients list, although you say to add it, but I had to use a sachet of seasoning anyway as I was in a rush (I used a chilli con carne one from the mexican aisle). Will definitely make them again! Just ate these for my dinner – woah can’t believe how filing they are. Next time I make I think I will use less rice – Hubble loved it too and he couldn’t even finish his lol!